2. Cool Roofs – Demonstrate and quantify the energy-saving impacts of cool roof technology and enhance the cool roof market in India through rigorous demonstration and quantification of cool roof benefits. Develop and test cool roof technologies, and advance the state-of-the-art technologies for both nations, ideally to the levels attained in the U.S. Characterization and demonstration of high-performance glazing and daylight harvesting solutions, energy efficient fenestration technologies and support the development of a rating system. Development of PCMs with industry collaboration and evaluation of material performance in line with international standards. Develop industry consensus test protocols that can be employed in standards and codes for appropriate PCMs that can help promote mixed mode operations, to reduce cooling and heating demand in Indian and US buildings. Further, assistance provided by ORNL to CEPT University for the design, construction, and commissioning of their new hygrothermal properties laboratories. Science-based cool roof specifications (model code) for Energy Conservation Building Code, India. 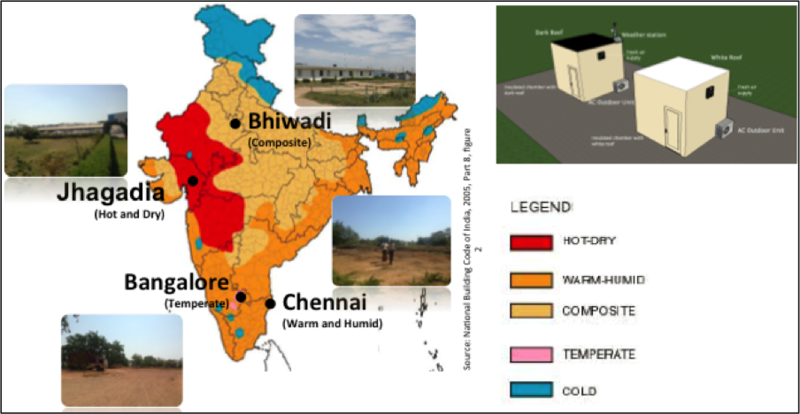 Calibration of the LBNL laboratory aging practice to Indian climates using the results from the weathering and aging experiment, supporting the development of Indian cool roof product rating system. Field experiments will demonstrate the impact of cool roofs in reducing energy use and improving thermal comfort (e.g., by reducing indoor air and radiant temperatures). Database of radiative properties of roofing products has been developed and is available for public use on the CBERD website. A Cool Roof calculator has also been developed and is available for public use. COMFEN-India an early stage modeling software tool has been finalized and released, and public training webinars conducted. New testing equipment , e.g. 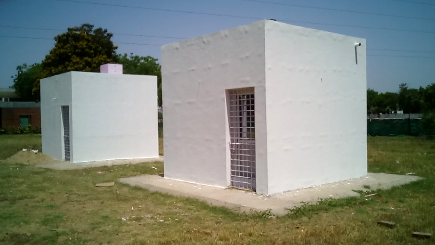 an Artificial Sky and Mirror Box measurement devices have been constructed, and training conducted at Indian University using matching grants. These would to support early design decisions about façade elements, windows, and attachments. Test bedding and performance measurement of ceiling tiles made of new phase change materials in naturally ventilated and forced ventilation modes. Cool roofs weathering and aging experiments being conducted with industry partner Saint Gobain in four different climate zones in India. Left: Screenshot of COMFEN-India, based on the LBNL tool COMFEN. This is an early design tool customized for India for selection of energy-efficient commercial fenestration. Right: Goniophotometer data plots of CBERD prototype laser cut panel, co-developed with industry parter PLUSS.